Did you read anywhere about Ms. Nikki Haley’s choice of drapes this week? Chances that you did are pretty big as the worldwide mainstream media blatantly copied an article posted in the New York Times earlier about her expensive taste in office decoration. The tale reached the French, Dutch and Australian press. The original NYT piece, which appeared in a translated version in many European newspapers by the same newspaper owner, was entitled “Nikki Haley’s View of New York is Priceless. Her Curtains? $52,701,” and complained about Ms. Haley’s apparent usage of taxpayers money to improve her offices. 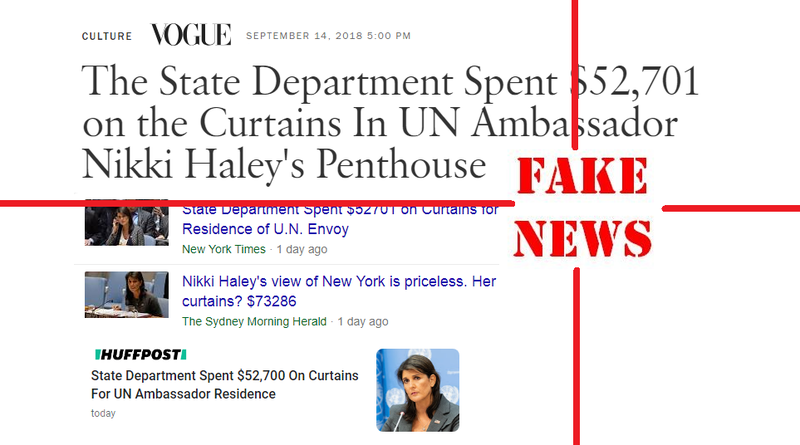 However, the mainstream media later corrected the article to make it clear Ms. Haley had nothing to do with the decision to spend the money on mechanized curtains in her official New York residence as the plans to buy the tapestries …. were made in 2016, by the Obama State Department. Of course, by that time, even CNN’s Jake Tapper (on Twitter) had moved in on it. Problem is of course that Vogue, the NYT, and the Huff Post, all once again used Ms. Haley’s picture to even state their correction afterward. And that the foreign press didn’t even put in the correction. Republican Florida Senator Mr. Marco Rubio attacked the newspaper afterward for planting their bias against anyone involved in the Trump administration, stating: "Want an example of subtle ways media pushes their bias?" "See this completely false & misleading headline about Nikki Haley. They are not 'her curtains' & buried deep in the story is the fact that this purchase was made under the Obama administration." And some wonder where the term “Fake News” comes from. I can't stand Nikki Haley. I can't decide whether or not she's as big a Ziocuck as Trump but come on, that would be difficult to do.